This is a quick reference list for the locations of show topics in Episode 305 of The Dr. David Geier Show. Should we perform heart screening for every young athlete in the United States? How strong is the ACL graft in the first couple weeks after surgery? Do you like to exercise or play sports, or do you have kids who play sports? 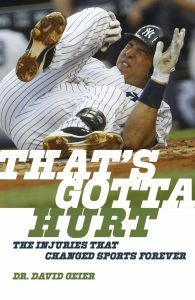 In my new book, That’s Gotta Hurt: The Injuries That Changed Sports Forever, I discuss some of the advances made in the world of sports medicine that has helped athletes perform better, play longer and recover faster than ever before. You should read it! Order your copy now from Amazon, Barnes and Noble, Books-A-Million, Apple iBookstore, Target, IndieBound or Powell’s Books.. Injury risk versus athletic potential: What should professional sports teams do?